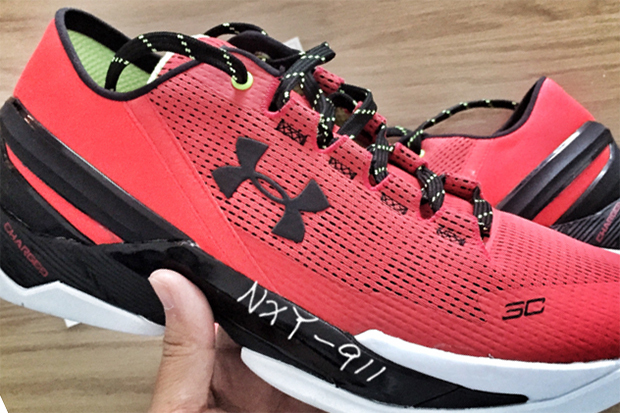 Here’s the first look at Steph Curry‘s second signature in low top form. The UA Curry 2 Low definitely deviates from the past installments thanks to a near slip-on construction while a breathable mesh base that’s sure to please those out on the blacktop this summer. The heel cage and unique ‘Charged’ midsole remain as does the fuse-like toecap for added support. The Under Armour Curry 2 Low promises to be lighter than the current model Steph is rocking en route to the best start in NBA history and is overall a sleeker, more refined design than last year’s low installment. The first look features contrasting lime green accents on the inside to clash with a bright red base. There’s still no storyline behind this particular colorway, but stay tuned for more updates right here on Sneaker News. Check out a full view below.